This post serves as notice for every Ontario Basketball (OBA) Active/Affiliate/Honourary Member (“Voting Member”) of the Call for Nominations for directors to serve on the Board of Directors for Ontario Basketball and the Call for Motions for the Annual Meeting of Members (AMM) on Saturday, November 10, 2018 at Abilities Centre in Whitby. The Board of Directors confirmed the appointment of John Lovett as Chair, Nominating Committee. Any individual interested in seeking election to the Board of Directors must be eligible as per By-Law 1 of OBA, and must complete a Nomination Form [.pdf] and a Nominee Profile Form [.pdf]. Nominations will be accepted until 4:00 p.m., on Wednesday, October 3, 2018. Voting for all eligible positions will be conducted by proxy/ballot, which will be communicated electronically and posted on the OBA website no later than Friday, October 19, 2018. The proxy/ballot will enable all voting members to exercise their right to vote even if they are unable to personally attend the Annual Meeting of Members. As required by the Ontario Corporations Act, elections will be held at the Annual Meetings of Members. Please note, however, nominations from the floor will not be accepted. Please submit all motions in writing to Jason Jansson by Wednesday, October 3, 2018. The Motion Form [.pdf] has been included. Please note, motions from the floor at the Annual Meeting of Members will be for discussion only. Given the success of presentations offered at previous annual meetings, OBA will once again invite corporate sponsors and partners in development to speak about relevant topics. Additional details to follow. If you have any questions or would like to discuss this opportunity in greater detail, please contact John Lovett, Chair, Nominating Committee. You can also contact Jason Jansson, Executive Director, at 416-477-8075 ext. 202. Please note: Ontario Basketball recognizes that the contact information for Active Members is subject to change during the course of the membership year. 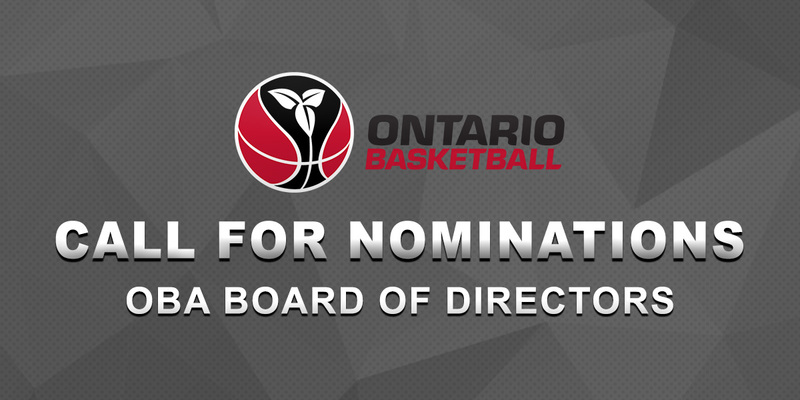 In order to ensure that Ontario Basketball provides appropriate notice to all its Active Members, this notice will be posted on the Ontario Basketball homepage during the period of the Call for Nominations. Written on 2018-08-29, in News.